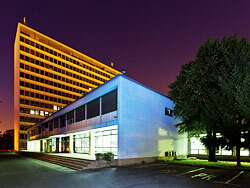 All conference events will take place at the Hotel International, Miramarska 24, Zagreb. 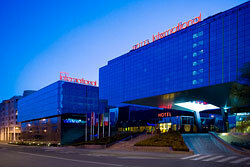 There is a special booking rate for conference participants in the conference hotel. More information is available in page Accommodation. 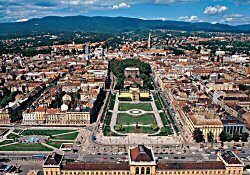 The Faculty of Electrical Engineering and Computing, University of Zagreb (FER) was founded in 1956 (under the name of Faculty of Electrical Engineering). The Faculty comprises 12 Departments, namely: Applied Physics; Applied Computing; Applied Mathematics; Fundamentals of Electrical Engineering and Measurements; Electric Machines, Drives and Automation; Power Systems; Telecommunications; Electronic Systems and Information Processing; Control and Computer Engineering in Automation; Electroacoustics; Electronics, Microelectronics, Computer and Intelligent Systems; Radiocommunications and Microwave Engineering. The Faculty buildings (43308 m2) include classrooms, laboratories, offices, a congress centre, teleconferencing room for distance education, computing centre, a library, a restaurant, and sports and recreation facilities.